Welcome to Our Wealth Alliance Discount Program! Legal Binders Now is proud to be your supplier for estate planning binders. Our portfolio binders present the professional image you want while keeping your client's documents organized. We offer two lines of high quality binders to meet your needs and are available to you with discounted custom imprinting pricing. Our Wealth Alliance Program offer members exclusive discounts off the published price of custom imprinted binders and stock index tab dividers. Our Premium Estate Planning Portfolio Binders are constructed of the highest quality hand crafted turned edge foam padded materials featuring elegant two-color black and gold leaf foil stamping and are finished with solid brass corners to protect the corners of the binders. These binders will convey a level of professionalism that your clients and peers will greatly appreciate. 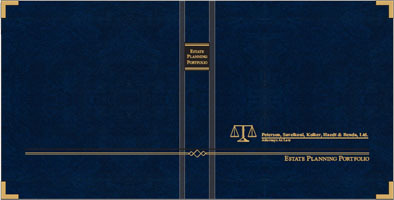 Our Deluxe Estate Planning Portfolio Binders are durable imitation leather vinyl binders that are one color gold leaf foil stamped and are manufactured with high quality materials to maintain their professional look with continuous use. Legal Binders Now is offering benefits exclusively to Wealth Alliance members. 10% discount off the published price on custom imprinted binders. Your discount will be shown at checkout. 20% discount off the published price on stock index tab dividers. Your discount will be shown at checkout. Multiple shipment dates for your order. You can choose to have your order shipped in up to 4 shipments within 12 months of your order. You will be billed based on the quantities shipped. Register using the special registration link below to create your account. Use the special password provided to Wealth Alliance members when you create your account. You can start shopping immediately! The Wealth Alliance discounts will be automatically applied when you check out. You'll be able to select the multiple shipment option at checkout. Selection Legal Binders Now offers a wide selection of portfolio binders and accessories. Select from our Premium or Deluxe Estate Planning Portfolio Binders for a quality binder to meet your needs. Imprinting Enhance the professional appearance of your Legal Binders Now Estate Portfolio Binders by imprinting your company name and logo. We offer custom imprinting on our premium and deluxe binders.